Brazilian President Dilma Rousseff has been officially endorsed by the governing Workers Party to run for re-election in October. Speaking to party delegates in Brasilia, Ms Rousseff promised to boost social policies that have lifted millions of people out of poverty. The party has been in power since 2003. Ms Rousseff - Brazil's first woman president - is a former left-wing rebel who fought against military rule in the 1960s and 1970s. She told some 800 delegates meeting at the party's convention that her second term would see more investment in housing, education and public health. "It is time to move forward, it is time to make more changes," she said. Ms Rousseff also defended public spending on preparations for the football World Cup and the Olympics, which Rio de Janeiro will host in 2016. "All the investment we have done for the World Cup in transport and other infra-structure will continue to benefit Brazilians after the event," said Ms Rousseff. She was elected four years ago, replacing her friend and mentor, former President Luiz Inacio Lula da Silva, who served two terms. Brazilians will go to the polls on 5 October. If no single candidate gets more than 50% of the vote, there will be a runoff on 26 October. Brazilians may be distracted by the World Cup but in the background the presidential election is starting to heat up. In recent weeks, the country's major parties have been building up support. Dilma Rousseff's Workers Party (PT) has renewed its alliance with the broadly based PMDB (Brazilian Democratic Movement Party). It means her campaign will have the largest share of air time on TV and radio, and strong support in Congress if she is re-elected. Meanwhile, the two main opposition candidates - Aecio Neves, from PSDB (Brazilian Social Democracy Party), and Eduardo Campos, from PSB (Brazilian Socialist Party) - are trying to attract smaller parties and the votes of Brazilians who are unsatisfied with the current government. The World Cup has polarised political debate in Brazil. After Ms Rousseff was booed and cursed at during the opening ceremony in Sao Paulo, former president Lula said that the attitude reflected the "lack of respect" among the country's elite. 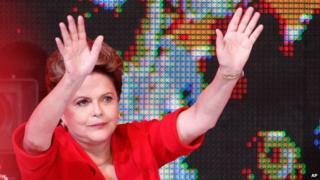 For Ms Rousseff, however, the boos are less important than the success of the World Cup. If the tournament ends without major failures, her opponents will lose some of the ammunition they were counting on to use to defeat her. Opinion polls suggest that she has about 40% poll ratings, against 20% for her main opponent, Senator Aecio Neves. But her popularity has declined over the years, with Brazilians taking to the streets to protest against corruption and spending on the World Cup and Olympics. Party leaders have denounced "a hate campaign" against the government. The Workers Party is expected to face its biggest electoral challenge since former President Lula came to power in 2002.